2. Beat the egg white and water in a small bowl. 3. Mix bread crumbs, basil, oregano and cheese in a separate bowl. 4. Using one hand, dip each ravioli in the egg mixture and let the excess drip off. Use that hand to drop the ravioli into the bread crumbs. 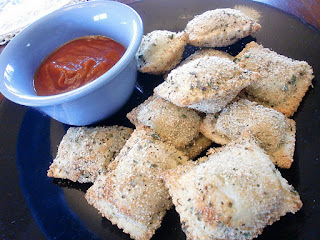 Use your other hand (the clean one) to cover the wet ravioli in the crumbs. (It's a little neater and you won't get clumpy egg stuff in the crumbs.) Then line them up on the baking sheet. 5. Bake at 400 degrees for 15-20 minutes, until they've puffed up and are toasty brown. Serve immediately with a marinara sauce or pizza sauce.